Topics: Meeting Schedule, For Current S, and Olar Detail. The estimated 16 daily visitors, each view 1.30 pages on average. It has 3 DNS records, ruby.metisentry.net, sand.ar51.net, and ruby.ar51.net. 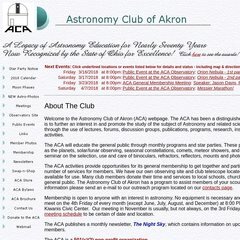 It is hosted by Area 51 Consulting Inc (Ohio, Akron,) using Apache web server. Acaoh.org's IP address is 207.54.129.244.